Bumblebees are important pollinators; their bodies are often seen covered with pollen grains. However, when visiting certain flowers they have a special mechanism for releasing the pollen grains from the anthers (the special sacs on the stamens). This mechanism is known as sonication or buzz pollination. When visiting flowers of the potato / tomato family (the Solanaceae) or blueberries, they land on the flower, use their mouth parts to hold onto a stamen and then use rapid contractions of their (thoracic) flight muscles to make the stamen vibrate. The effect of these vibrations is to allow the pollen to be released from the tube-like anthers from a pore or small slits (poricidal stamens). Though bumblebees act as plant pollinators, they actually visit plants to collect pollen as it is an important source of protein - for the larvae in the nest. 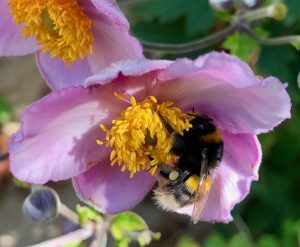 Recently research work at Stirling University has demonstrated that exposure to a neonicotinamide (thiamethoxam) interferes with buzz pollination. Working with 'captive' bumblebee colonies, the bees were monitored / recorded as they visited buzz pollinated flowers. It was found that exposure to the pesticide - thiamethoxam (at levels found in agricultural fields) not only interfered with the vibrations generated as they collected pollen but also affected the bumblebees ability to 'learn'. The bumblebees not exposed to the insecticide visited more flowers, and the more pollen they collected so they gained in 'experience' ; however, those exposed to the insecticide did not 'improve' - their pollen collecting ability staid roughly the same. Indeed, compared to control bees (those with no exposure to insecticide), they collected about half the amount of pollen .